Nineteen-year-old Marius Ciustea suffers from paraplegia after a recent skiing accident. He is now paralysed from the waist down. 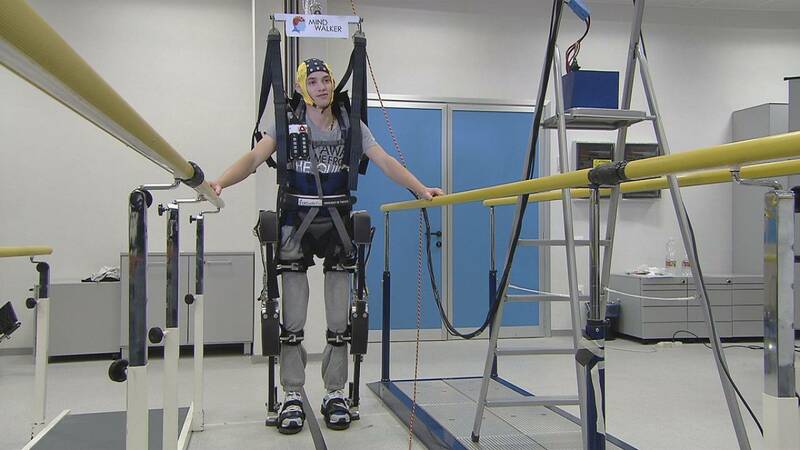 The exoskeleton that is helping Marius and other victims of paraplegia has been developed and tested by scientists from a European Union research project. Both physical therapists and neurologists see enormous advantages in the prototype. “With conventional rehabilitation techniques, these patients would not be able to walk along these parallel bars without any kind of help. It would be absolutely impossible for them to regain the sensation of walking. This exoskeleton allows these patients to get the sensation in a natural, physiological way. The exoskeleton allows the patients to move their hips, and these hip movements are absolutely key in all conventional rehabilitation techniques”. Researchers are looking even further. They dream of helping victims of paraplegia to walk again by controlling exoskeletons on their own… with their brains. An ambitious aim, full of challenges. Michel Ilzkovitz a telecommunications engineer,at Space Applications Services Mindwalker project said: “Ideally, we would like to develop a system that is able to control the exoskeleton just by capturing the signals coming from the patients brain cortex. We are still not able to achieve that, for a number of reasons. First we have the skull barrier. The skull stands between the brain signals and the instruments developed to measure them. That means that often the signals we get are not neat, nor clear enough to be used. We then have the difficulty of dealing with the vibrations created by the exoskeleton itself. This constant noise disturbs the quality of the brain signals we get and it makes it difficult to use them”. To overcome the difficulties, researchers are looking for shortcuts to the brain. One such shortcut is through the eyes. They are working to help the retina to stimulate the brain, so they can identify and isolate the brain signals to potentially control the exoskeleton. It is complex research that scientists hope will provide reasonable solutions, to victims of paraplegia in the short to medium term.